Our beautiful horses are the heart of our trail rides, lessons and therapy. 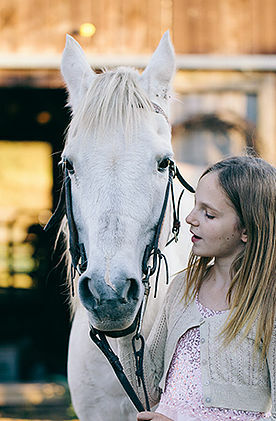 The barn is home to eleven experienced trail horses, each with their own personalities and skills. From the tiny old lady of the barn, Delight, to our gleaming star that is Jerusalem, there are horses to suit every skill level. 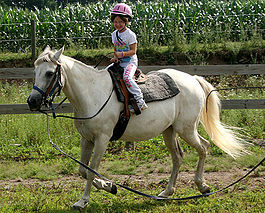 Most of our horses are 'gaited' which means an extra smooth ride with less bounce. Most public trail stable horses are elderly and are obviously worn out. Our horses have passion and personality making for a lively interaction for our riders during our trail rides. Come stay with us and get to know our remarkable horses for an even more life-changing experience at Wildfire Ranch! This little white unicorn is a 27 year old (about 75 in people years!) Arabian and Connemara pony. Standing only 14.3 hands, she is actually large for a pony, right at the cut-off between pony and horse. Delight has the fine-boned beauty and endurance that Arabians are famous for, but the calm obedience and sure-footedness of Connemara ponies. She was a champion show-jumper and mother of 5 foals before she came to us as a children's lesson horse. Delight is one of the most trustworthy horses we have, and has alrady taken many children on mountain trails in complete safety.